Collective Blog: Ag-nutrition policy: Where are the women? The State has to take the lead in recognising women’s work in agriculture. Dr. Nafisa Shah, member of Pakistan’s National Assembly, saw the starting point for any meaningful action to be the country’s constitution. She also highlighted that the Benazir Income Support Programme (BISP) and Sindh Land Rights policy have placed women at the centre by treating women as “real agents of change rather than recipients of aid”. Even though Pakistan has been on the trajectory of placing women at the centre, there is a lot that still needs to be done. Ms. Khushi Kabir, a seasoned activist who works with women and men from marginalised communities in Bangladesh, emphasized the need for gender-sensitive machinery in agriculture, including efforts to target women beneficiaries for agriculture subsidies and tailoring the policy on landless peasants by giving land to women without the presence of any male member. Ms. Indira Dahal from the Law Commission in Nepal shared about the policies and programmes that improve nutrition and food security by focusing on cultivation done by women. The Agriculture Development Strategy (ADS), she said, is a fundamental step that empowers women involved in agricultural activities, and increases their participation in the sector. 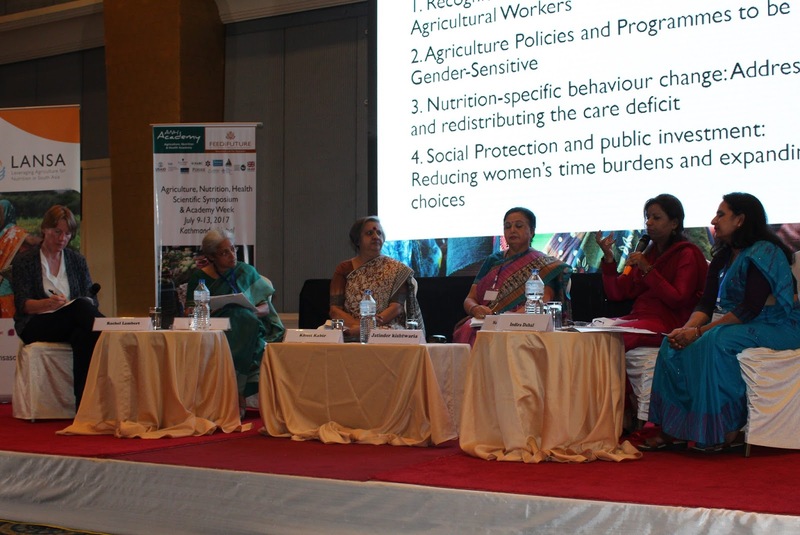 The Ministry of Agriculture in Nepal has been working to increase women’s ownership of land, and also trains women farmers. In addition to state policies, there also need to be efforts to shift mindsets on the ground. Ms. Kabir emphasized the need for engaging with both men and women at the household and community levels. Dr Jatinder Kishtwaria, Director of Central Institute for Women in Agriculture, India echoed the need for attitudinal shifts amongst men and women. The participants highlighted the need for multilaterism in South Asia in tackling these issues and called for a wider regional dialogue. There is a lot that policy makers can learn by talking to each other. In Pakistan, I believe that it is not just the federal or provincial governments that need to push forward greater recognition of women’s work, but rather, the activists working with women and men, the donors, the political parties, the male farmers, and other groups directly or indirectly linked with the agriculture-nutrition nexus need to be actively engaged. There has to be top-down and bottom-up approach while drafting and implementing policies and programmes to improve nutrition.